A huge day from Adam LaRoche, a few bases loaded walks, and a decent outing by John Lannan helped the Nationals defeat the Marlins 7-4 in the first game of the doubleheader on Friday at Nats Park. John Lannan started out slow with the bases loaded and 0 outs in the first. But after a double play by the Nats, Lannan escaped only giving up one run. After the first, Lannan calmed down and settled into the ballgame. But in the 7th inning, Lannan allowed two runners and went down 2-0 to the next batter getting the heave in the middle of the at bat. The crowd gave John a standing ovation to thank him for the spot start. 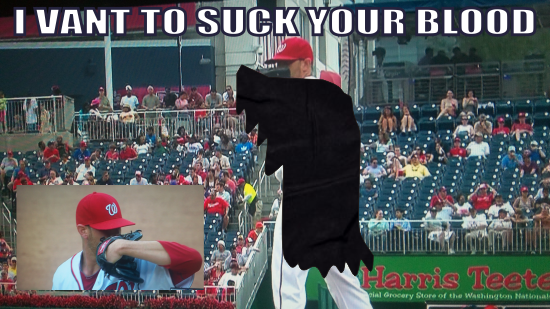 Lannan only gave up 4 hits on the day, but he walked 5 batters through 6 innings. John will return to the minors again, where he will wait for his next opportunity. LaRoche hit a homer for the 2nd day in the row (and a foul ball that was SMASHED into the upper upper deck). Adam was 3 for 4 with 3 RBIs. Zimmerman had 2 doubles on a 2 for 3 day and Jayson Werth drew three walks to go along with a single. Mark DeRosa had 3 RBI on a hit and a bases loaded walk. LaRoche also had a big defensive play in the game, a schoolyard kickball play. With the infield fly rule rubbed out on a bunt attempt, LaRoche dropped a ball on purpose to get a double play. Every starter had a hit except for former starting catcher Jesus Flores. Late in the game, Davey removed Drew Storen in the middle of an at bat (1-0) in the 8th inning. Two pitchers removed mid-batter in one game is a very odd thing. Somehow, after Mike Gonzalez allowing the tying run to be in the on deck circle, Tyler Clippard had to be used in a save situation. He picked up his 22nd save, but not before the Marlins scored another run.